Now, we are talking here about “Russian” Georgia, not the one in the United States. 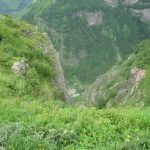 It is one of four countries in the region between the Black Sea and the Caspian Sea known as the Caucasus, the others being Azerbeijan, Armenia and the southern part of Russia. All were members of the Soviet Union until 1991. The area is geographically in Asia but politically closer to Europe.and I suppose if I was being hunted by the police I might be described as a ‘white Caucasian male’, although this racial link is rather vague,. 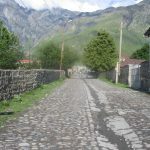 Since declaring independence Georgia has had a chequered history with considerable internal strife, leading to two large areas of the country, South Ossetia and Abkhazia, themselves claiming independence. This status is recognized only by Russia and few other countries, and the British Foreign Office advises strongly against visiting those areas as no diplomatic support is available there. 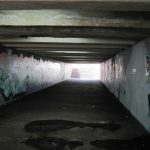 Georgia is not the easiest place to get to from Britain. 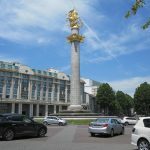 There are only two flights a week in each direction, from Gatwick, and the outbound flight was the absolute last one of the day at 10.55pm, arriving in Tbilisi at 6.35am the next morning, a Sunday. 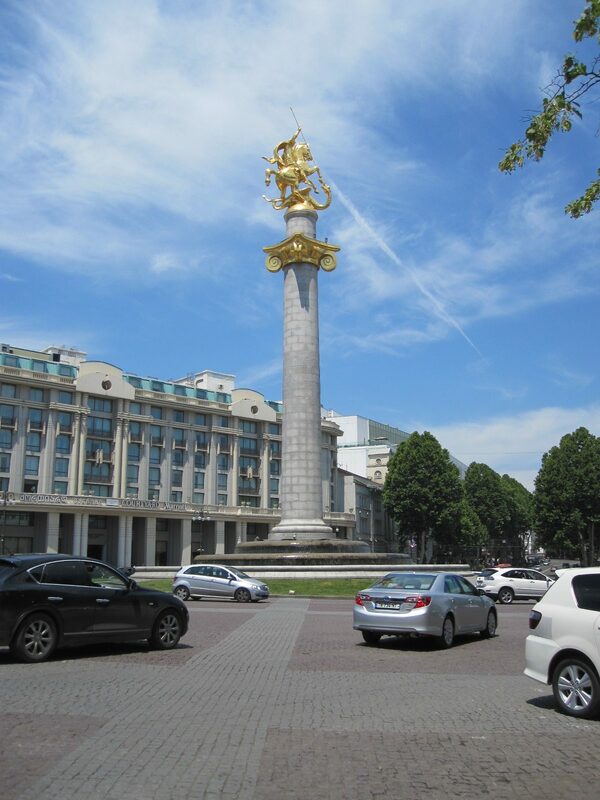 The plan was to get some rest on arrival if possible and then spend some time looking round Tbilisi before getting an early night to catch up on some sleep, so that I would be in a fit state to pick up my car on the Monday morning. The people at the Amadeus Hotel were very helpful, arranging for a taxi to pick me up from the airport and allowing me to check in early for some rest as I had hoped. I had chosen the Amadeus in the belief that it was near the place where I would be picking up the car, but that proved to be incorrect, and when the confirmation came through from Avis it turned out that the car hire office and garage were right in the city centre. At 11.00am, after resting, I set off on foot for the city centre which was about two miles away. The hotel was actually on the top of hill, with a long flight of steps leading down to a huge roundabout and flyover system. 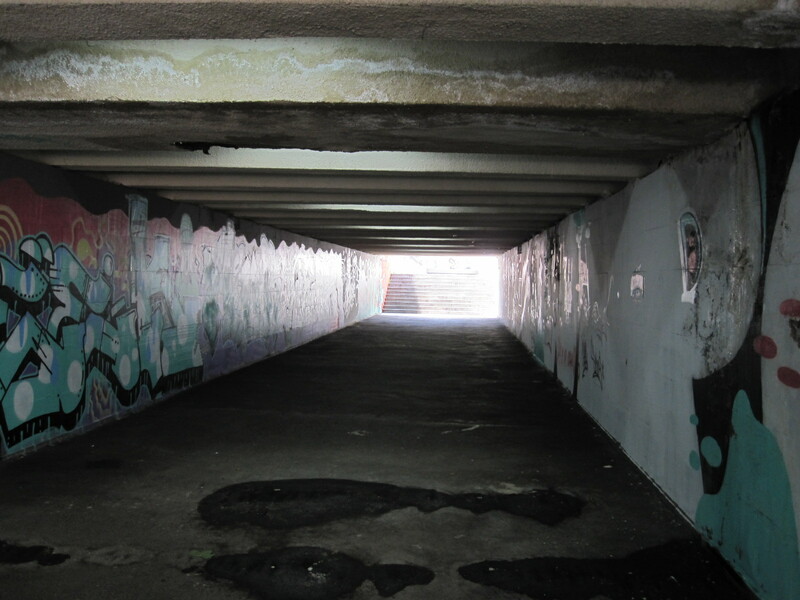 Getting through that entailed walking though deserted graffiti-lined passages and tunnels which was slightly uncomfortable, but I could not see any alternative route. 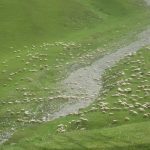 It was then an uphill walk for a fair distance, and with the hot weather I was soon starting to flag, so decided to hail a taxi, of which there were many around. 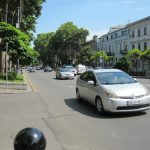 Within a short time the road changed into very smart avenue lined with some quite impressive buildings, not at all what I had expected in Tbilisi. The taxi driver did not miss the opportunity to point out what a fine city it is. not give rise to the name of the country. After dealing with Avis I had a snack in Dunkin’ Donuts, a company which strangely has a strong presence in Georgia. 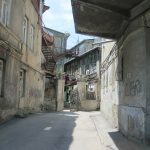 The old town is immediately adjacent to the Square and unlike many ‘old towns’ it has not undergone any significant restoration, having a large number of genuinely old buildings in extremely dilapidated condition. From the state of some of the balconies overhanging the street I can only assume that they do not have a very strict building inspectorate. 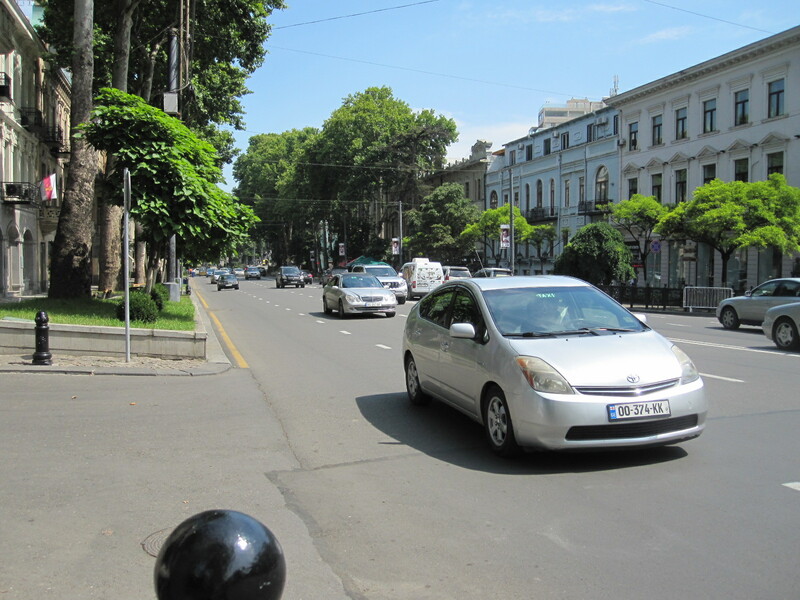 Walking back along Rustavelis, the fine avenue along which I come in the taxi, it was an opportunity to study the route that I would take in the car the next day. Tbilisi has an astonishingly complicated road system, with largely one-way streets, and I could see that it would be very easy to go wrong. 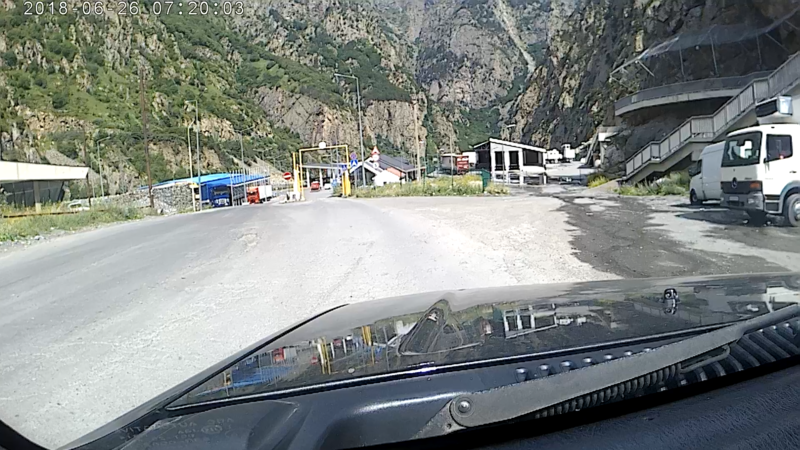 I found the big junction that was below the hill with the hotel on it, but failed to find the long flight of steps and eventually finished up climbing the wrong hill!. After scrambling through an area of rough woodland I got back to the hotel exhausted. At 9.00pm I asked the lady in charge if there was a restaurant nearby, and she directed me to one not far away. When I emerged from the quiet streets around the hotel it was an unbelievable sight, a road with shops and restaurants all open late on the Sunday evening. These included what appeared to be a new McDonalds with a line of expensive cars stretching back down the street from the DriveThru. This was not what I had expected to find in Georgia at all. The next morning (Monday) the hotel arranged for a taxi to take me to Avis in Freedom Square to collect my car, theplan being to drive up the Old Georgian Military Highway to the Russian border. 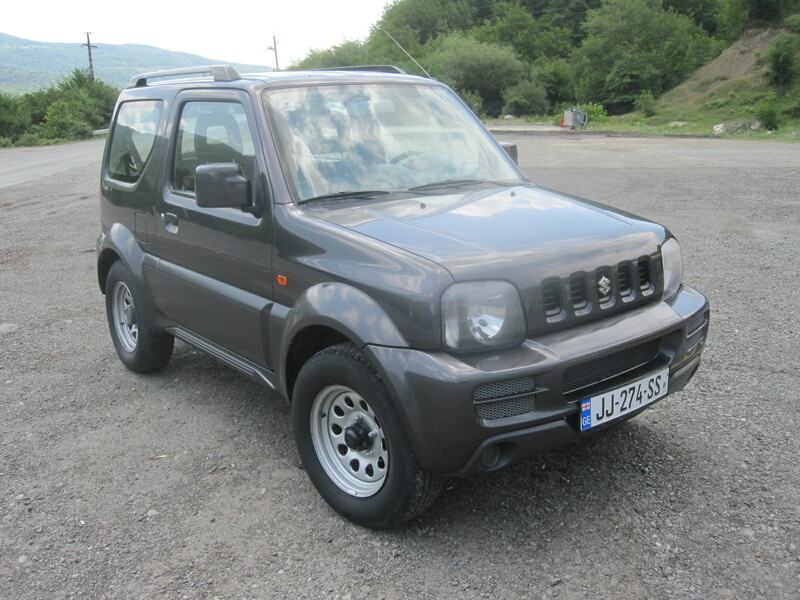 Because I thought the roads would be bad I had reserved a Suzuki Jimny (small 4x4 jeep) which is crude and not very comfortable, but has a reputation for being tough and good on rough ground. 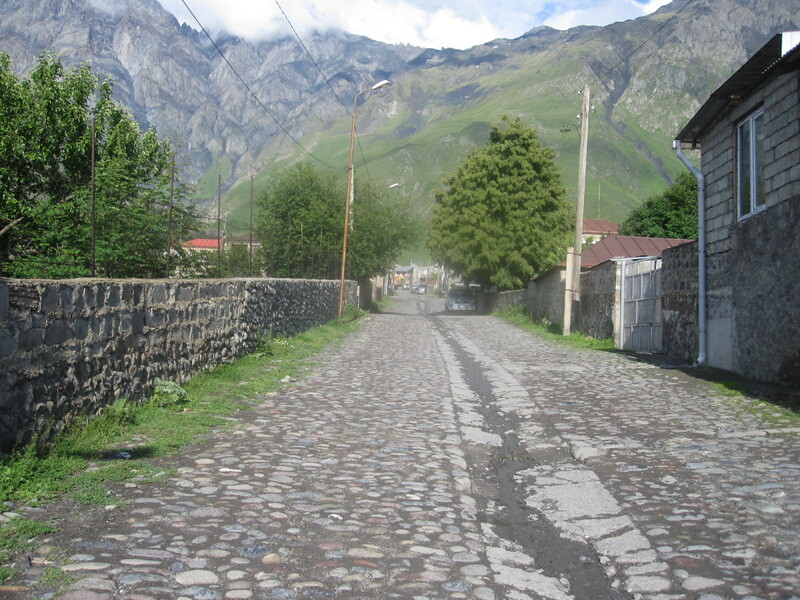 My night stop would be in Stepantsminda (also known as Kazbegi), a ski and hiking resort about 95 miles from Tbilisi, where I was hoping to find a hotel on arrival. After doing the paperwork I had wait a while in the Avis office before a man came in and said the car was outside. This was at the side of the road in Freedom Square. We went out to it, completed the condition form and checked the spare wheel and tools. The man went back into office, leaving me to get sorted out. I adjusted the seat and mirrors, and was just setting up my phone and tablet for navigation when two policemen appeared. They did not speak any English, but wanted the car document, which I showed them. I pointed to the Avis office and said “rental”, thinking that they would go away. 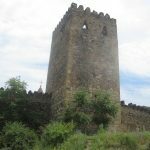 But no, it was clear that they meant business, and within a short time instead of going to the Russian border I would be languishing chained to the wall of a rat-infested Georgian prison. Fortunately the Avis man saw what was happening from his office window and came rushing out to speak to the police. He said to me “Go on, go” so I had to drive off into the city centre traffic without my navigation gear working. By some absolute miracle I found my way down to the riverside, and once I was there I thought if I followed the embankment northwards it would lead me to the Old Military Road, which turned out to be correct. 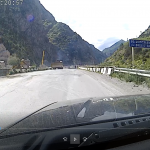 The driving in Tbilisi was not too bad, but when I got on to the single carriageway main road it was dreadful, with a lot reckless overtaking going on in both directions. This continued for about 10 miles as a flat, straight road with uninspiring scenery before entering a more attractive area alongside a river which eventually turned into a lake. The road then climbed into mountains with much less traffic and really outstanding scenery, passing a number of interesting places that I resolved to have a look at on the way back. 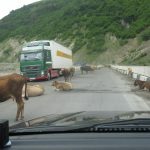 Most of the other vehicles in both directions were lorries going to and from Russia, as this is now the only road link between Russia and Georgia open for normal traffic. 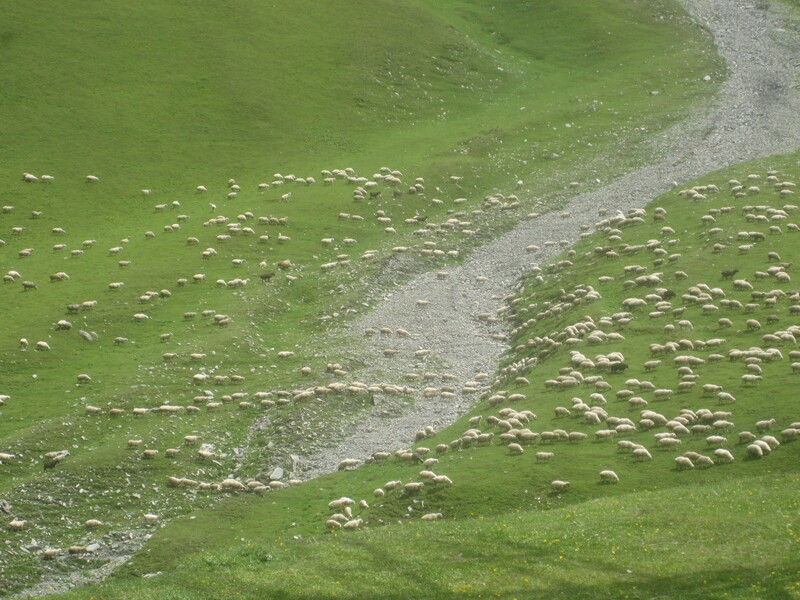 It climbed for miles with steep hairpin bends and was very slow going at times. Mostly the surface was good, with a few rough stretches, and in one place there were cows all over the road, like India, although I don’t think they are revered to the same extent. 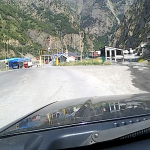 About 15 miles before Stepantsminda is the Jvari Pass (7,815ft), with an extraordinary monument to Georgian-Russian friendship, which I decided to look at on the way back. 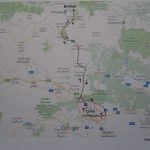 According to one route plan I had read the journey would take just over two hours, but that must have been written by Lewis Hamilton, because it actually took about five hours to get to Stepantsminda. 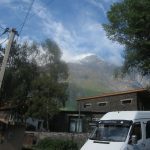 This turned out to be a small straggling town, with a considerable number of places offering accommodation, and I chose one called the Easy Hotel (nothing to do with easyJet) with good parking in the town centre. 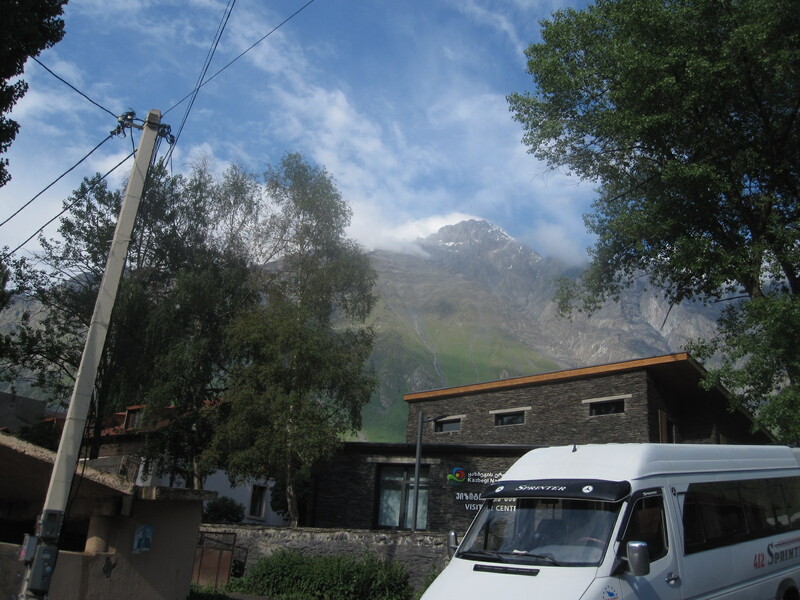 It had a view of the snow-covered peak of Mount Kazbek, a dormant volcano and at 16,558ft the highest mountain in eastern Georgia. Once sorted I went for walk round the back roads of the town. Places like this are always interesting, because most houses have some land attached, and people often keep things that in a more densely populated area would be disposed of. There were a lot of Russian ex-military vehicles around, and various other items of machinery, including an old wind generator designed to be independent of wind direction. The roads were all roughly surfaced. The main street was quite touristy, with shops and cafes, one of which was a converted railway carriage. Visitors had arrived in a couple of buses, and the place was fairly busy. After an uninspiring breakfast the next morning I set off for the Russian border, about 10 miles away. 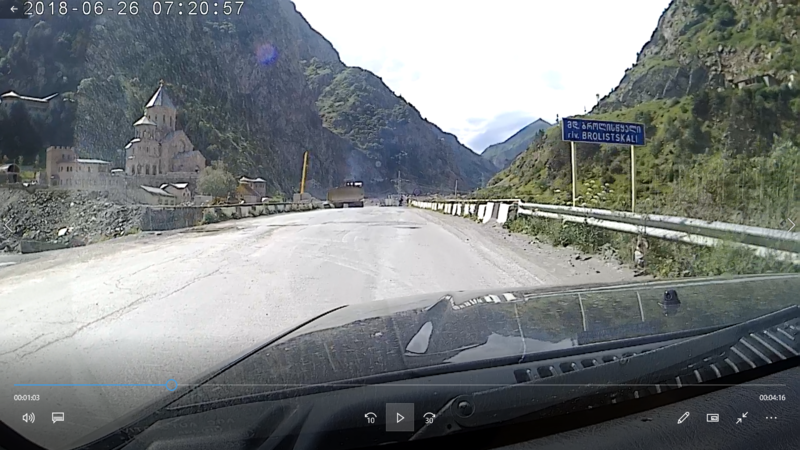 Shortly after leaving the town the road entered a gorge with the mountain face on the left hand side and a sheer drop on the right, protected by a concrete barrier. The scenery was magnificent. For most of the distance it was bend after bend, and some places it was possible to see the road in front suspended from the rock face over the sheer drop. The surface was mostly reasonable, with occasional large potholes, and in one place it was broken up completely for about 20 yards, causing me to come down to walking pace and pick my way over big lumps of tarmac and rock. 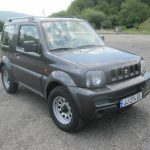 This could easily lead to serious damage in an ordinary car, and I was pleased that I had the robust little jeep with its high ground clearance. width and changes in the level of the road that were on the limit for the jeep. The few cars going through seemed to know exactly the line to take to avoid damage, but I was glad not to be in one. I followed a lorry through the narrow section and as I came out was amazed to see the Dariali Monastery, a complex of beautiful buildings set back from the road. It seemed very out of place in what is now a hostile environment, but when the work is finished it will hopefully revert to a more peaceful existence. 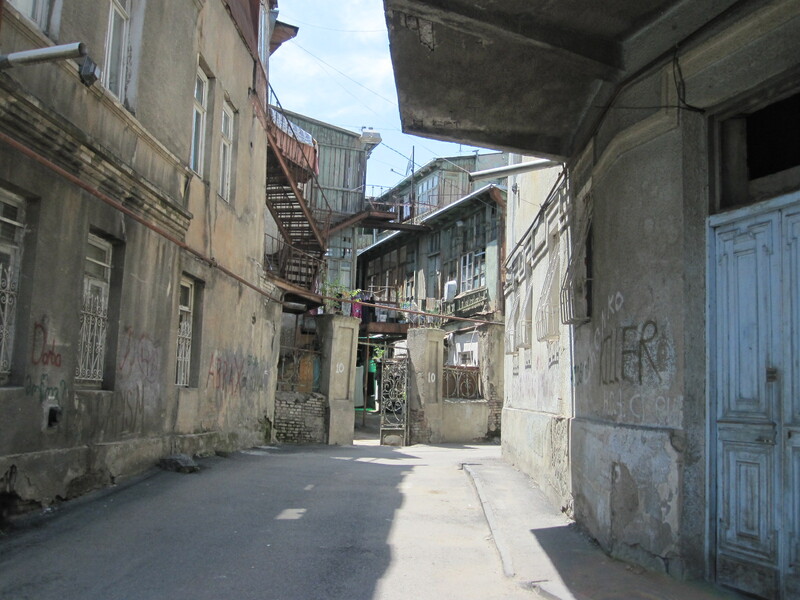 In front of the border control buildings I turned round and retraced my steps through the mess to Stepantsminda and onwards in the direction of Tbilisi. 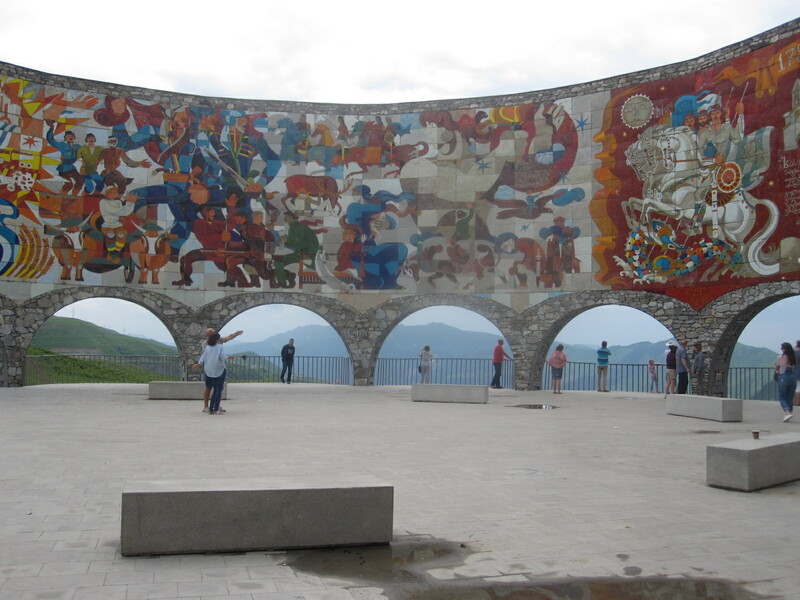 As planned I stopped on the Jvari Pass to look at the Georgian-Russian Friendship Monument, an amazing curved concrete structure with massive murals above archways with superb views across the mountains. Although it was a weekday the car park was almost full and there were many people around, some using the nearby quad bike practice area. 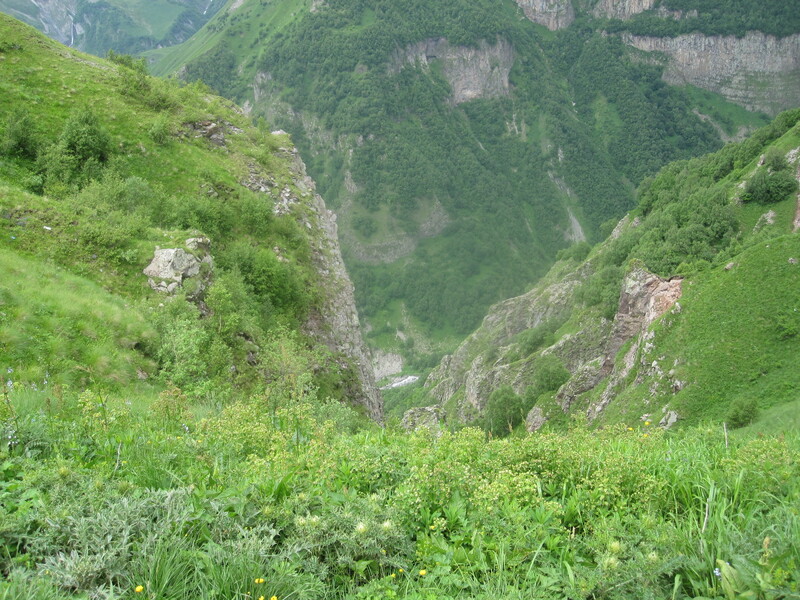 South of here the road runs about 2km from the forbidden territory of South Ossetia. 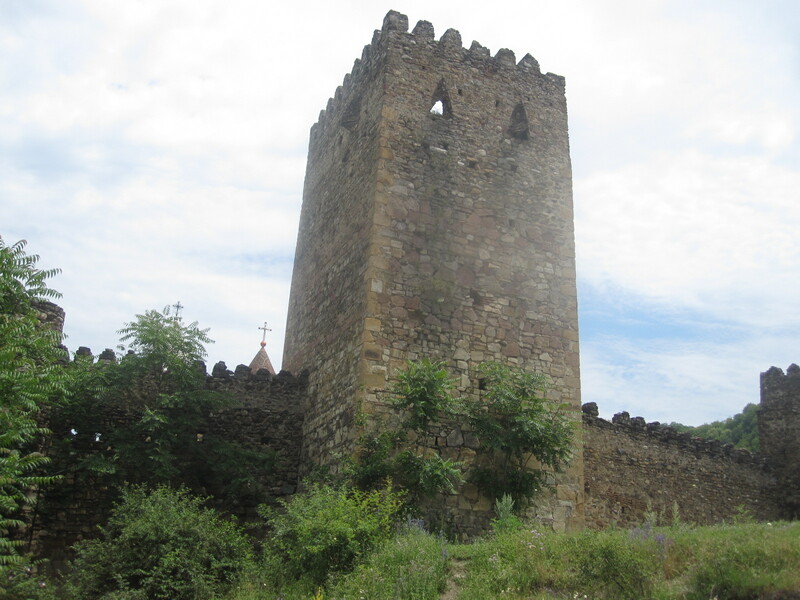 The next stop was the fortress of Ananuri, on a hillside near the road 45 miles north of Tbilisi. 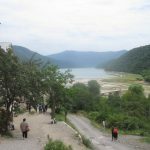 With beautiful views overlooking a reservoir in the valley this is a major tourist attraction. As it consists mainly of two churches within a walled area I could not go in because I was wearing shorts, a rule that applies to most religious buildings in that part of the world. 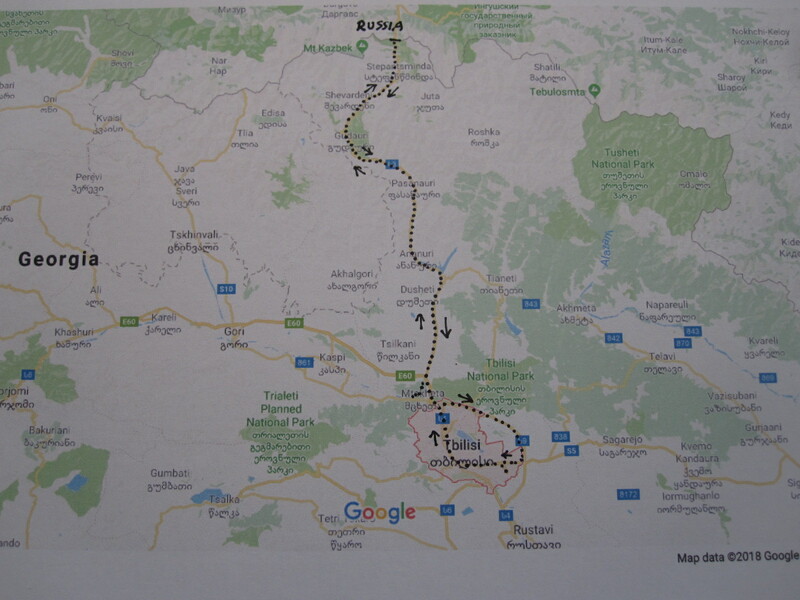 My target for the day was a town called Mtskheta, some distance north of Tbilisi. 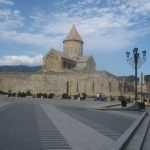 Often regarded as the spiritual capital of Georgia, it is one of the oldest towns in the country, dating back almost as far as the 3rd century BC. The maps in my phone and tablet showed a number of hotels in the central area, all of which turned out to be in narrow streets with no parking facilities. 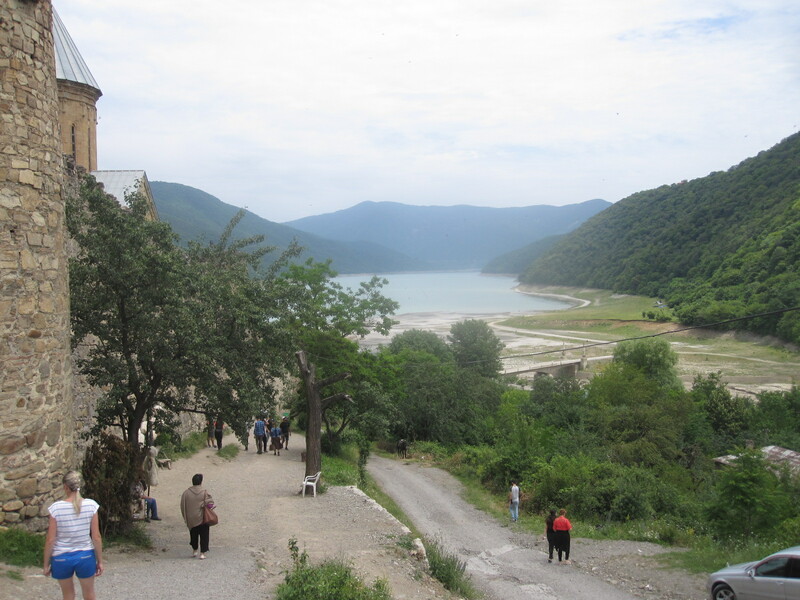 Eventually I found a good, big hotel, the Mtskheta Palace, overlooking a river within walking distance of the centre, all for the equivqlent of £27 per night including breakfast. 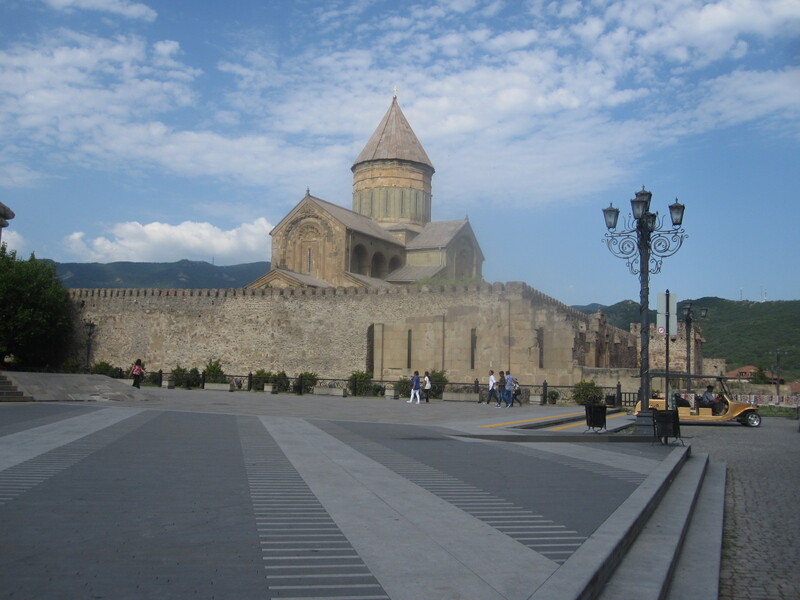 The town is centred around Svetitskhoveli Cathedral, a beautiful walled church dating from the 11th century and claimed to be the burial site of Jesus’ robe and several Georgian monarchs. It is surrounded by old stone buildings housing shops and restaurants. 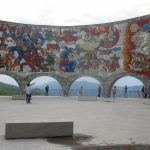 Overall I thought Mtskheta was a pleasant town and worth visiting, although I was too late to go into the cathedral. 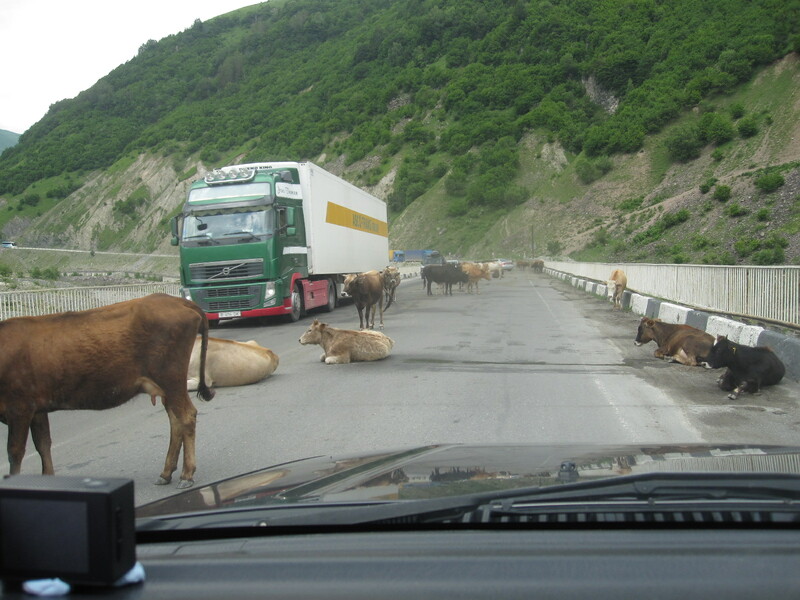 The next morning I set off for the airport via the cross-country route b9 missing out Tbilisi. 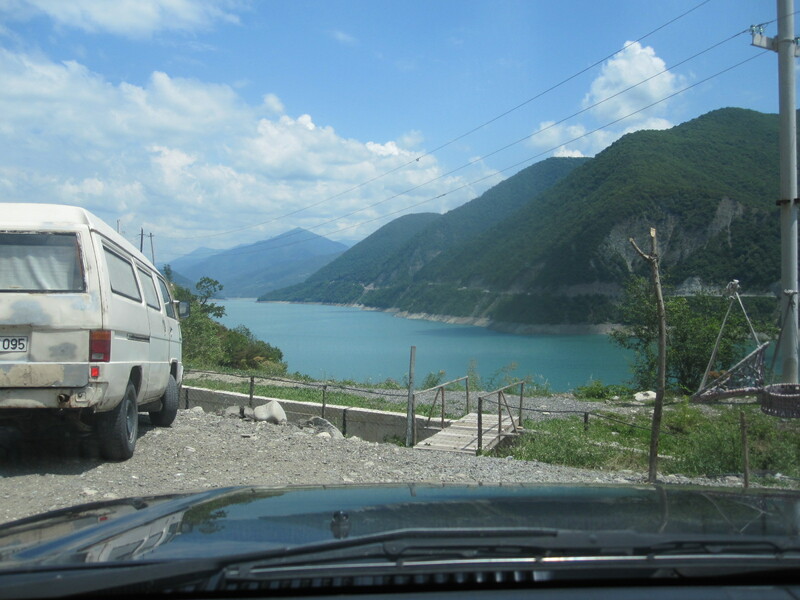 This was a straightforward drive through good countryside, with a few stretches of dreadfully broken-up road, where again I was pleased to have the jeep. I stopped for coffee at a place like a truck stop with a huge car park and a couple of buildings in front of which were people, mostly men, sitting drinking. A lady came out from a building and I asked for a coffee, but she seemed to be completely unable to understand. When I started walking back to the car a man shouted and waved a tin of Nescafe. I said “Yes” and within a short time a cup of mind-bogglingly strong Nescafe appeared. A couple of the men tried to enter into conversation with me. When I said “English” they said “Rusky” and I concluded that they were Russian lorry drivers. Somehow we managed to hold a conversation about where I was from and what I was doing, and we parted good friends. The lady from the café refused to accept payment for the coffee, apparently because I was considered to be good entertainment, a situation I have encountered elsewhere. A few kilometers before the airport was the entrance to a massive shopping mall consisting mainly of market stalls, and as I had a some time to spare I went in. It really was vast, stretching about 400 yards back from the road and about 600 yards the other way, reminiscent of the Grand Bazaar in Istanbul. When I came to go back to the car I got completely lost in all the aisles and had to use my phone to find the way. By now the car was quite dirty, and one of the conditions of the car rental was that it must be returned clean, otherwise there would be charge of 15 euros. The map in my tablet showed a car wash just off the road into the airport. When I found it it turned out to be two or three blokes on a piece of rough land with a shed. They had just finished washing a car, and I pointed to mine and said hopefully “Wash car?”. They looked at one another, shook their heads, and said something like “Nah”. It was very hot weather and I suppose they had done enough for the day. Anyway, when I returned the car to Avis the people didn’t say anything and there was no charge. My overall impression of Georgia was quite favourable, much better than I expected. Despite its recent turbulent history it seems to be doing quite well. The scenery in the area I went to was really good, and I believe most of the rest of the country is similar. Generally things are cheap by our standards and apart from the police and car washers the people I met were friendly and helpful .